The reduction of strain-wave, but using a &apos;single&apos; stage planetary gearset. This is a compact, &apos;single&apos; stage planetary gearset where the output is derived from a second ring gear varying a few teeth from the primary. With the current model of 18 sun teeth, 60 ring teeth, and 3 planets, this results in a &apos;single&apos; stage gear reduction of ~66.7:1. A regular planetary gearset of this size would have a reduction ratio of 3.3:1. That is a whole lot of torque in a small package. The design is thin, flat, equal height for the gear stages, and nearly all of the force is applied right at the edge. That would lend itself really well to being laser cut and driven with a pancake BLDC motor. First I think I need to explain how a normal planetary drivetrain is constructed. The power input turns the sun, and the sun drives the planets which rotate within a stationary ring gear. The planets are mounted to a carrier with bearings, and the carrier is where you take your output. To get further reduction, you can add more stages just like the above, all sharing the same ring gear. The stages multiply, so 3 stages of 3:1 would give you a 27:1 reduction. Problem here is now you need 9 planets, 9 bearings, 3 suns, 3 carriers, and 3 times the height too.. If you try to get more than about 3:1 reduction per stage, you end up needing fine teeth and a small sun gear. Small sun gears don&apos;t survive very long unless made of some heavy duty stuff and so 3D printing/laser cutting that doesn&apos;t work so well. The power input turns the sun, and the sun drives the planets which rotate within a stationary ring gear. So far the same. However, instead of taking your output from the planets, we allow the planets to just rotate within the ring, and cover them with a second ring gear. The second ring gear is constructed to vary from the stationary ring gear by exactly numplanets teeth. Now, on each revolution of the planets the two ring gears will advance with respect to each other numplanets teeth. We take our output as the second ring gear and get massive gear reduction from it. We can now use a much larger sun gear to drive the planets, and still get significant reduction. Perhaps even wrap the perimeter of a BLDC outrunner. We only need one bearing, which essentially supports the joint itself. The vast majority of the force applied to the joint is right at the outer edge of both ring gears and drives both in opposite directions at multiple locations. We can get away with using much cheaper materials to do it. Picking a compatible gear ratio is critical, so here are the rules for the math required for the gearing. The simplified version for 3 planets is use a multiple of 6 for both the sun and ring gear teeth, and then an output ring gear tooth count of ringteeth - 3. And here is a video. C code to generate MPRT.dxf Note: No user interface, hard coded! A Modified Planetary Robotic Transmission gear design concept. Download both files into same dir, open this one in OpenSCAD. The red gears are the first layer and the green gears are the second layer. Only the first layer has a Sun (pinion) gear. 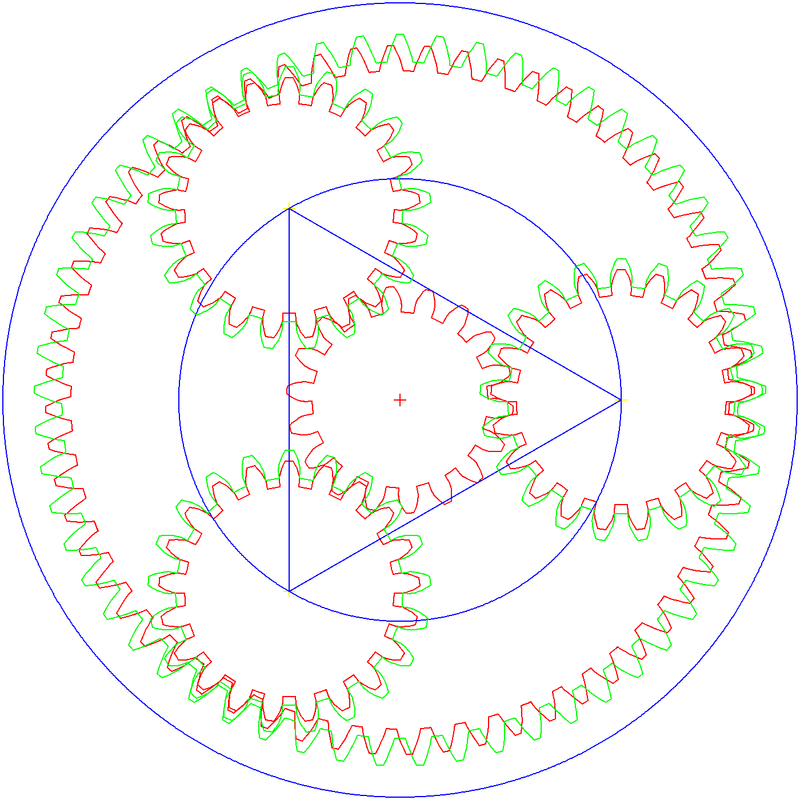 The planetary gears (red and green) are locked to each other (they do not rotate independently of each other, i.e the layers are fixed to each other). The outer layers rotate freely of each other. Initially I used Gearotic (as I have a licence) but Gearotic is tricky to use if you have not used it for a while and the exported DXFs are not great. And the gears are not one shape (each). The are short poly lines. While this was not a problem in the past when I was using Windows because I had a macro for my CAD package that could join the polyline segments. Unfortunately the macro feature does not work under Wine (as I have migrated to Linux). In the end I decided to write my own gear code in C and export my own DXF gears. The DXF file format is an absolute nightmare. While exporting points and segments are easy, exporting PolyLines (i.e. shapes) that CAD packages can read in is not. I found some old code that I have written for PolyLines and thought great, lets try this. Well yes, it imports into my CAD package but my CAD package converts the PolyLines to segments. Not good. I found some more old code that I have written for lwPolyLines and thought great, lets try this. Well it was unfinished, I was having problems with the "handles" and never solved it. Then I though, perhaps the problem with PolyLines is my CAD package. So I installed LibreCAD and yes it imports PolyLines properly. LibreCAD does not have a macro language but as it can import PolyLines, Segments and Points it does not matter if I can created simple DXF files in C. Move over DeltaCAD, LibreCAD coming through. I will upload the gear code later, it still needs a user interface. But I have uploaded the DXF file. If the gears are the wrong size you can just re-scale them. Now that I can design the gears for the MPRT, I can now look at the SCARA elbow design. Created a Github repo and uploaded the latest. This will likely change pretty shortly.. The MPRT project is both very interesting (for those who appreciate mechanical things at least and/or robotic) and useful. It is particularly useful for SCARA robots. This is my interest. I have a Prototype SCARA project (https://hackaday.io/project/164066-prototype-scara) that uses direct drive stepper motors. I want to upgrade to geared drive. I have designs for belt drive but then the MPRT project came along. Relatively simple, compact and high gearing ratios and potentially (to be demonstrated) low backlash. Ideally suited to a SCARA elbow. Not an off the self product, needs quite a bit of research, and trial and error to get it right. The concept is not a full design so you have to use your imagination. The concept here is a driven planetary ring (cyan circle and the three planet (pinion gears)) and driving the two separate centre rings. Notice that the planetary gears are linked by the cyan ring and the planetary rings consists of two sandwiched and locked gears that drive the two centre (sun) separately (unlocked). Although it looks completely different to Daren&apos;s concept is is basically just a rearrangement. In operation, the planetary gears turn and rotate around the sun, but locked to where the sun gears align. As the Sun gears have different number of teeth they have to rotate at different speeds to meet the planetary gears. You should be able to see the blue and black gear pair, and the magenta and red pair, superimposed on each other. You can see these gears are tightly meshed, no compromise. Construction and design of the gears is very straight forward (no tricks required). As an aside, I am using DeltaCAD, a cheap ($50) and really nice 2D CAD package. It comes with a macro language that I used to create my gears. Well this will be the topic form my next post. Model a spring loaded split planet to eliminate backlash. The split will be across the diameter and provide force in one direction. This will spring it against the rotation of the other two planets, eliminating backlash. <EDIT> Little problem here. The other side of my split planet would be meshing with the sun gear. I would like to keep the sun gear full height as it keeps the forces nicely aligned so I don&apos;t need bearings for them. The challenge is coming up with one I can laser cut. A 3D printed version will be pretty simple. I would also like to try to *lower* the gear reduction a little. 66:1 is a little excessive and prevents fast motion without really high speeds. I changed my mind and made the output ring gear something you can actually use right now by adding a bearing. It breaks the laser cut equal height paradigm, but that could easily be undone by splitting it into three layers. These three layers are all solid with your output anyway, and so could be modeled to be directly be part of your &apos;arm&apos;. Cleaned up the source a lot. New source is uploaded. Brought the &apos;involute_gears.scad&apos; script up to date with the current state of OpenSCAD to eliminate warnings. Made wall thickness a variable. Added recesses for stepper screws. Two wrongs, make a more wrong. I both under-extruded and set values which were too large for backlash/clearance on my proof of concept. The under-extrusion was mostly on purpose. I didn&apos;t need this to handle any kind of load, and under-extrusion of gears produces perfect profiles with far less thought. However... the backlash/clearance values I used were from another project where I had also planned to intentionally over-extrude everything to ensure I had completely solid gears for my high-load application. So the result is my gears don&apos;t mesh well and have massive clearance/backlash. It does work though, but I won&apos;t do a video of it looking like this. It probably didn&apos;t help that I also intentionally doubled the backlash value for the output gear to ensure it wouldn&apos;t bind as it will be running a less than perfect involute gear profile. I also increased the tooth pitch (which means smaller teeth) so I&apos;m in uncharted territory for printing these. These teeth are smaller than I have ever printed at 0.4mm nozzle size. I&apos;m beginning to deduce some of the magic required here to make the gears mesh. I stumbled upon a compatible gear set by accident originally, but now I think I understand what is actually going on. The sun gear tooth count must be divisible by both 2 and <num planets>. The ring gear tooth count must be divisible by both 2 and <num planets>. Stationary ring gear tooth count - sun tooth count must be an even number. So basically... for 3 planets I will need multiples of 6 for both the sun and ring gear tooth count. For the test I&apos;ve settled on 18 sun teeth, 60 ring teeth, and 57 output teeth. Planet tooth count is a always a function of the sun/ring tooth count and ends up being = (<ring_tooth_count> - <sun_tooth_count>)/2. So for this test, they will have 21 teeth. I increased my pitch a little so it still fits on a Nema 23, from 0.965 to 1.05 and I&apos;m using a pressure angle of 24. I re-used a previous source to build this one, so it is a complete mess with most of it commented out. Also, if you want to be a part of working this out, ask. Nice project! I tried something very similar a while ago. It&apos;s not documented as I could not really make it work. But is was supposed to be part of https://hackaday.io/project/21619-gearboxespy which is a part of my box generator. My experience was that the torque trying to twist the planets is a real problem if you try to get away without a planet carrier. It may work for well lubricated, pretty flat planets. There are a few more things I came across but I need to read through your logs first to see what you already stumbled across yourself. An alternative to using a not properly meshing output ring gear is using stepped planets. One would use a second, free wheeling sun gear to support the upper side of the planets. This also allows even higher ratios. When making the upper parts of the planets one tooth smaller than the lower one the output ring gear has to be only one tooth smaller than the lower ring gear. As the center of the planets are determined by the lower planetary gear set only half of the difference in planet size is in effect on both sides of the ring gear. Stepped planets is the current minor goal, although I was going to try to keep them the same tooth count and just vary the pitch to match the rings. I think this already has *too* much reduction, but yes... having as little as one tooth difference would be allowed with stepped planets for insane single stage ratios. The same output equation applies, but num_planets is now &apos;input_ring_teeth-output_ring_teeth&apos; instead. I have also been wondering why this type of gear set is not more common. After thinking a while I figured it is probably due to the poor efficiency. A "normal" gear set looses the same amount power in each stage. The mechanical work lost is basically force by distance by coefficient of friction. For each meshing pair the product of force and distance is the same although the values of those parts is changed (that&apos;s the purpose of the gear set after all). The problem with this setup is that the teeth of the planets see the force of the output while still traveling the distance of the input. So the losses of the "delta" stage is multiplied by its reduction ratio (not including the gear reduction of the traditional planetary gear set between the sun and the planets). But that may be an acceptable price to pay in some applications - like Scara robot arms. To say this in different words: I am super excited to see some performance numbers. May be you can wind strings around the input and output shafts and attach weights to see how much torque gets lost on the way. I mean as soon as the basic stuff is worked out. Although a cage is not absolutely necessary for the planet gears, are they recommended or just optional? I have made up a preliminary SCARA elbow based on your concept. For my first prototype I will run waxed wood (candle waxed MDF) on waxed wood. No point getting to complicated on a prototype. It would depend on your material choice probably. Planets on bearings can stay centered in the envelope with a smaller rubbing area. Planets rotating freely will slide around the face of the rings. Also, the forces generated here will want to want to rotate the planet about the contact area between the two rings and the planet, and therefore some rubbing of the top/bottom edges against the top/bottom ring could happen then. I used PLA for the prototype here, so if I ran it for 5 min at max speed under any kind of load... it would definitely melt. If I did it out of nylon though, it would be fine. A drop of grease and both would probably be fine. I&apos;m going to do the planets and sun out of nylon, and the ring gears out of PLA I think. The planets being nylon will let me print them a tiny bit oversized (negative backlash in the OpenSCAD model) and eliminate backlash that way. They will have to be ring shaped so they can flex a little to work like this. As for staying in place during rotation in general, that won&apos;t be a problem. They are captive. I would say add a drop of lubricant, and you can skip the carrier for the planets. If you are going to do this out of MDF though, you may want to split one of the planets across the diameter, pin them back together on the center line with some piano wire, and add a crescent shaped groove to both that you can drop a spring into to eliminate backlash. It might not work due to meshing with the sun gear as well, but with solid gears that would be the simplest way I can think of right now. Genial Project!!! I have just one doubt do you have an idea if with this kind of gear reduction our torque reduction will be the same as the speed reduction? I was wondering if that kind of non-conventional reduction will be able to increase the torque as much as it reduces the speed. Minus friction, yes. You are going to lose a little more than normal for a planetary system here due to the imperfect involute tooth profile between the output ring gear and the planets. If I had to guess, I&apos;d say you could potentially throw away 3-5% of your power there. Although if you are asking if this can be back-driven to produce lower torque/higher speed... I don&apos;t know. I wasn&apos;t able to do it with the 3D printed prototype, but there is no technical reason beyond the *really* high torque required that it wouldn&apos;t work. How do you guys come up with these ideas? I can&apos;t even imagine why this works? Having the OpenSCAD source handy for the latter allowed testing out this idea with just a couple of edits the first time around. Then again the sheer amount of stuff on my workbench right now could have just as easily have randomly assembled itself into this. I feel stupid because I still do not understand it. I understand planetary gearboxes pretty well. But I cannot understand the stage where you have put another ring gear on top. Please let me ask few things which may make me understand what is going on. 1) By "numplanets teeth", you mean for each planet gear, there will be one teeth, right? 2) Are the stationary ring gear and second ring gear concentric? If Yes, 3) How come the planet gears are touching a ring gear with 3 more tooth? Perhaps I could answer all those if I was familiar with OpenSCAD, but unfortunately I have never heard about it, not used it. @alireza safdari Eliminate the fact this is planetary for now. Imagine a gear with 60 teeth. Now put another gear of the same diameter right next to it with 57 teeth. Drive both gears with another gear of 21 teeth. One is going to turn a little faster than the other. That difference is where I am getting my output. It is the difference between how fast the two bigger gears turn with respect to the gear turning them. One just happens to be held stationary here, and it happens to be inside out as it is a planetary system. Hope that helps. @Daren Schwenke Now I get it. The key part for me was this "gear of the same diameter right next to it with 57 teeth". I think it is important to mention the diameter is the same. I did not know you can have matching gears with different number of teeth but same diameter. Could you tell me what I should read to learn how its done? But wow, you are genius. I can&apos;t even imagine how you ended up with this idea. Fantastic job. @Syamil Zaini check this out. @alireza safdari Actually...logically, you are correct. You can&apos;t have two gears of the same diametrical pitch and tooth count be the same diameter. That&apos;s kinda the definition of diametrical pitch. I altered the diametrical pitch so the diameter was the same with the 3 tooth count variance between the gears. This results in a less than perfect involute tooth profile, but at that diameter, the deviation from the perfect involute tooth profile was smaller than my target gear backlash of 0.1mm. Mathematically correct involute teeth do not slide at all when they mesh. These will, a little. I&apos;m still betting it is far less friction than you would get with cycloidal, worm gear, and perhaps even strain-wave transmissions so I think it&apos;s worth it. @Daren Schwenke Now I can die in peace :D Thank you for your time and writing back. Wonderful concept @Daren Schwenke . Can&apos;t wait to see something with bearings in. I wondered in the past, when I was working intensively on the designs for the strain wave and hypocycloidal gears I made, whether sending a gear around the perimeter to force phase alignment of a small section of teeth would be good. Never managed to think of a good way to do it. You have found a way to do it that I think could be great. Also you&apos;re getting a rotation reduction ratio of sun teeth / ring teeth so surely the few percent at most due to the slip would be small beer? Then again the slip may lead to very large ratios. This visualisation is doing my brain in. The first stage reduction is sun teeth to ring teeth ratio like a normal planetary. Usually like a 3:1 ratio. But the &apos;second stage&apos; is then for each revolution of the planets, advance (num planets) teeth. For a larger number of teeth and a low planet count that could easily be 15:1, which is where I think this could work really well. Surely the equation for the ratio should incorporate the slip fraction and not the number of planets? In the limiting case where the upper and lower teeth are aligned there will be no ring rotation no matter how many planets there are. There is no slipping occurring here. The resulting drive ratio is directly related to the fact that the two ring gears *only* line up with each other where the planets are interfacing to both rings, and then only for a couple teeth. Translate around the ring by 360/(num planets) degrees and the teeth for the two rings are directly opposite each other. But you agreed below that there would be some wear due to the imperfect meshing. Here&apos;s a thought experiment: Say the upper and lower rings have the same number of teeth. Result will be the planets rotate and also circle the sun and no movement of the movable ring happens. So the conversion ratio should be some function of the number of teeth in the upper and lower rings and not depend on how many planets there are. I really need to see an animation. Yes, a perfect involute gear profile results in needing no sliding of the gears over each other to transmit the force. This being an imperfect meshing would therefore require some sliding. However the difference between perfect and imperfect doesn&apos;t change the resulting gear ratio. It just alters the efficiency of the transmission. Given other gear systems such as cycloidal or worm gear drives have much more resulting friction/lower efficiency, I think we are still in a pretty good place with this design. The "Laser Cut" concept is why I like it so much. Just have to work out the bearing arrangement. A teflon ring between the outer gears and a thrust bearing on the shaft with a retainer? My thought was to put your bearing for the output ring on the motor shaft directly. Two layers. One laser cut being the full face of the ring gear with a bearing sized hole, and the the actual ring gear having a smaller hole to retain the bearing. <EDIT> Um.. thinking about it, that won&apos;t work.. :) Might need 3 layers. Provided you can keep your applied force centered on the axis, should work. Off axis, you would need a second (probably expensive) ring bearing, or to support it from above and limit the rotation. For SCARA I can limit the rotation which gives options for support. >Planets interface with one stationary ring gear, and one moving ring gear which varies in tooth count from the stationary one by (number of planets). In that case shouldn&apos;t the depiction of the planets show upper and lower teeth? If it&apos;s a straight tooth from top to bottom then the moving ring cannot differ from the stationary ring. Ah... but it can if you are willing to fudge the diametrical gear pitch a tad for the rings. The pitch of the planets is the same top/bottom engagement. However, the ring gears vary in pitch just enough to create your difference between them of (num planets) teeth. Of course this is not a &apos;perfect&apos; involute gear then, but the larger diameter you go, the less it matters. That fudging even at just 45 teeth for the ring gear was still well within the value I chose for &apos;clearance&apos; of 0.2mm. Double that tooth count and the difference in your backlash/clearance is down to well below the tolerance of what you can laser cut/3D print. Ok but isn&apos;t the slip going to lead to wear in the long term? If the moving ring has less teeth than the stationary ring then doing a thought visualisation the leading edge of the planet&apos;s tooth will rub against trailing edge of the moving ring&apos;s tooth. Yes, it will wear more than the perfect profile. Now that you mention it though, it may be possible to do the planets as two layers with pitch profiles which correspond to each ring and fix that though. Perfect for laser cutting. Not so much for printing (overhangs). Or maybe you could modify the profile of the moving tooth so that the trailing edge matches up but the profile has a steeper edge to pull the ring forward a bit. Just adjusting the clearance and backlash values of the involute tooth profile does have a similar effect to this though, and it turns out that the values I have used for 3D printed planetary systems in the past is within the range of the required deviance values to make this work! A brilliant idea. Took me a moment or two to see the second outer gear. When I get back to my SCARA I will look at it. An animation here would help greatly here with visualizing the result, but that&apos;s work. The design lends itself to being laser cut, so I&apos;ve reached out to my cohorts who have such equipment at the ready. I can probably animate it if I sit and think about it. The model I threw together for this doesn&apos;t lend itself to that very well though. I could probably print it faster. You are about to report the project "MPRT - Modified planetary robotics transmission", please tell us the reason.